This is two recipes, rolled into one, courtesy of Mia Kristensen from CPH Good Food in Denmark. I collaborate with Mia to give New Nordic cuisine classes in London. This recipe was one of the stars at our Summer 2012 class. You could use the recipes separately, ie use the marinade for a different piece of meat, or cook the leg of lamb without marinating it first. The sourness of the buttermilk creates a fresh aroma in the meat. The combination with salt, honey and mustard enhances the natural flavor of the meat and improves the juiciness. Pour the buttermilk into a sealable container which is big enough for both the meat and marinade. Stir in the salt, honey, herbs and mustard. Soak the meat in the mixture and leave to marinate for 48 hours in the fridge. Turn the meat over after 24 hours. One hour before it’s time to cook take the meat out of the fridge to bring to room temperature. Cook as you normally would – grilling/roasting/frying/braising. 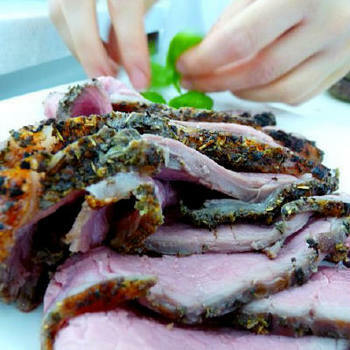 For extra juicy lamb, marinate it in advance in buttermilk – see recipe above. Season the meat all over with salt and pepper. Lay the handful of herbs inside and roll up the meat, securing it with several pieces of string. Heat some butter in a heavy-based pot or frying pan and brown the meat all over. Place meat in a roasting tin and bake at 120C for about an hour or until an instant read thermometer inserted into the thickest part reads 50C. Take the meat out and increase the oven temperature to 240C. Make the herb crust by combining all the ingredients, and then spread it over the top of the lamb. Roast the lamb at 240C for 5-10 minutes or until the crust has browned nicely. Remove the lamb from the oven and let rest for 10-20 minutes before removing the string and slicing.